Following my usual monthly trawling exercise I see Apollo Duck are now advertising another Lindau Class at US$390.000, which is a lot less than Snow Petrel ex Thekwini was at US$1.450.000, but she dose not so much gear and upgrades advertised. I will take a chance following Kremlin,s detection work that this could be ULM, the spares vessel, if the photo is of the correct vessel with that wonderful blue. Not sure only saw 3 of them there last week. Certainly one with a blue hull but two still in grey. I´m from Germany an I served from 1986 to 1990 in the German Navy with the 4th Minesweepersquadron in Wilhelmshaven, northern Germany. The neighbour squadron was the 6th one with 6 boats of the 351 class with the TROIKA-system, (Lindau class) that type of boats you discussed here. Oure Squadron was also equiped with Lindau class boats but the 331 class minehunting vessels. 12 of them in the squadron. All 18 boats based on the original Lindau class, the 320 class. The boats were upadated from 1968 to 1979 to the 331 and 351 class. I´m very familiar with this boats. I´am just online with my website www.minenjagd.de, a site about the mine warfare in the german navy since 1904. I´m always looking for photos of all kinds of german minesweepers for my webside. It would be nice if you will give your permission to share your photos with me. Feel free to ask what ever you want. www.fliegerschicksale.de - Airmen fates of WW2 in the Bremen area - English language available. www.minenjagd.de - Mine warfare in the German Navy since 1904 - Only German language. You are welcome to use any of the photos that I have posted. Only three City Class / ex-Lindau still at Simonstown. SAS Mangaung (ex-FGS Paderborn M1076), with SAS Tshwane (ex-FGS Schleswig M1073) behind her. M1221 - SAS Tshwane (ex-FGS Schleswig M1073) - entire service in reserve. Seen 17th March 2012. M1222 - SAS Mangaung (ex-FGS Paderborn M1076) - entire service in reserve. Seen 17th March 2012. M1225 - SAS Thekwini (ex-FGS Wolfsburg M1082) - sold as "Snow Petrel"
(ex-FGS Ulm M1083) - purchased for spares. Seen 17th March 2012. (ex-FGS Konstanz M1081) - purchased for spares. Sunk as an Exocet target during Exercise Red Lion, 1st November 2007. Last I identified the Kapa, she had square bridge windows, with the Snow Petral having round ones ... from which I deduced the Snow Petral was then the Thekwini. Now that FB post reckons Snow Petral = Kapa .. This ex-Lindau id lark is now %&%*! @# frustrating. Drop Captain Knox a line and he may be able to help. The one on FB has that radar mast! SAS Kapa - Snow Petrel was recently sold to work in marine security industry. Still in East London. 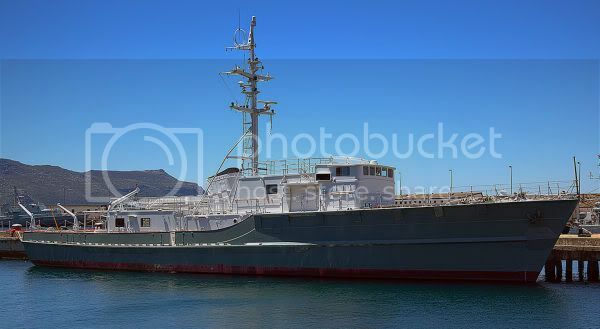 SAS Thekweni - Grey Fox is currently in Cape Town harbour waiting to be sold as the expedition yacht. Paderborn and Schleswig are being broken down for metal scrap. Anyone willing to buy the wooden hulls are welcomed to make an offer. 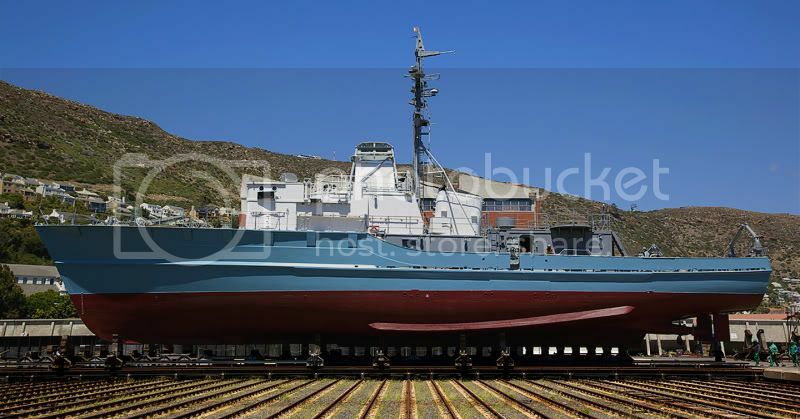 Ulm will either be sold as a security vessel (after being re-powered and refit) or converted to a restaurant to work either in Hout Bay or in V&A. Make an offer to who?